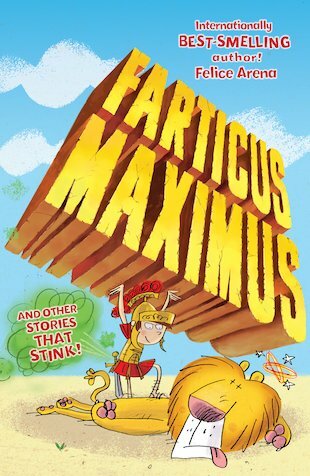 Farticus Maximus is a boy whose gassy gift has made him the greatest gladiator ever. In the ring, his luckless rivals find that his almighty wind may not be silent – but it sure is deadly! Meet Farticus and a stinking crowd of his smelly sidekicks in nine trump-tastic tales to blow you away! There’s the teacher with a wicked case of wind (sound familiar? ), a grandpa who can’t stop guffing, and heaps more pongy characters besides. Foul, flatulent and ridiculously hilarious, this book is for anyone who thinks farting is funny. Come on, we know that includes you! This book is very funny if you like farting. The other stories are very funny and have lots of farting in. This book is really good and very funny. It’s actually very rude, but I love it. Theres all these other stories in it as well, and they are also very good.